This pendant will update your home with its eye-catching design. Featuring a satin brass finish and matte black shade(s), this fixture will accommodate a variety of dicor styles. With its easy installation and low upkeep requirements, this pendant will not disappoint. Satin fabric shade with decorative cut outs and a reflective acrylic liner inside. Includes 5 feet of chain for adjusting height - Hang semi flushmount or longer. Pendant attaches to 5 inch diameter ceiling plate and can be hung from vaulted or slanted ceilings. The SKAR large pendant features a matte black finish.This contemporary style is not only decorative but unique. The open metal cage adds additional appeal. This is perfect for the foyer, stairways, entrance ways, dining and living room as well as many other commercial applications. 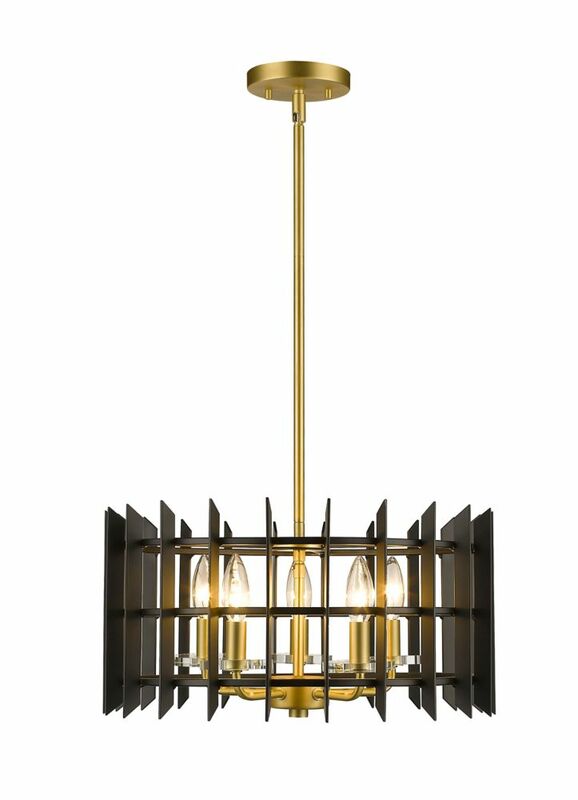 5-Light Satin Brass Pendant with Matte Black Steel Shade - 17.375 inch This pendant will update your home with its eye-catching design. Featuring a satin brass finish and matte black shade(s), this fixture will accommodate a variety of dicor styles. With its easy installation and low upkeep requirements, this pendant will not disappoint.